Cuban professional boxer and world welterweight champion who was known for his “bolo punch,” a combination of a hook and an uppercut. Gavilan said that cutting sugarcane during his youth in Cuba helped him to perfect his punching technique. He was a flashy fighter and a skillful boxer who began his professional career in 1943 and compiled an impressive record in Cuba and Mexico before moving to the United States in the fall of 1946. His first world title match was fought on July 11, 1949, when he lost a 15-round decision to the defending world welterweight champion, Sugar Ray Robinson. In 1951 Robinson vacated his title and moved to the middleweight division; Gavilan gained international recognition as welterweight champion by defeating Johnny Bratton in a 15-round match. 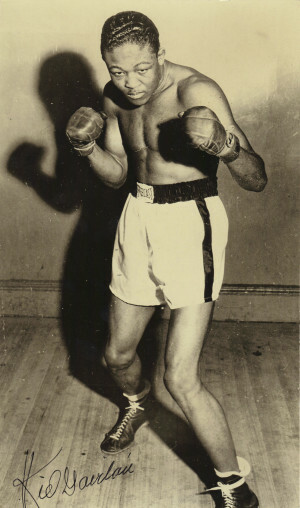 Gavilan successfully defended his title three times in 1952, against Bobby Dykes, Gil Turner, and Billy Graham, and three times again in 1953, knocking out Chuck Davey in 10 rounds and winning 15-round decisions over Carmen Basilio and Bratton. Gavilan tried to capture the middleweight title on April 2, 1954, but lost a 15-round decision to Carl (“Bobo”) Olson, and on October 20, 1954, he gave up his welterweight title when he lost a controversial 15-round decision to Johnny Saxton. Many reporters at ringside believed that Gavilan had won that fight, and there was speculation that the fight had been “fixed” without Gavilan’s knowledge. Gavilan’s career began to decline thereafter, but he did not retire until September 1958. He began losing his sight at the end of his career. Gavilan was inducted into The Ring magazine’s Boxing Hall of Fame in 1966.